WHEN I WAS A LITTLE GIRL, I USED TO LOVE LOOKING IN MY GRANDMA’S JEWELRY BOX. She had large statement necklaces, colorful brooches, big turquoise rings, and endless pairs of clip-on earrings. I would try it all on and feel so fancy and grown up. She had a place for everything. After her passing, as an adult going through her jewelry boxes, everything still looked as I remembered from when I was a kid. And it’s because it was well cared-for. I am frequently asked questions about how to care for jewelry. People wonder everything from how to prevent or remove tarnish from jewelry to how to untangle chain easily. In answer, I thought I would put together a useful list of the do’s and don’t for caring for your jewelry. Whether it’s costume or fine jewelry, if you care for it properly, it will stay pretty and last longer. ~Clear nail polish is your friend. You can use clear nail polish to prevent discoloration and chipping on costume/fashion jewelry you can apply a thin coat of clear nail polish as protection. 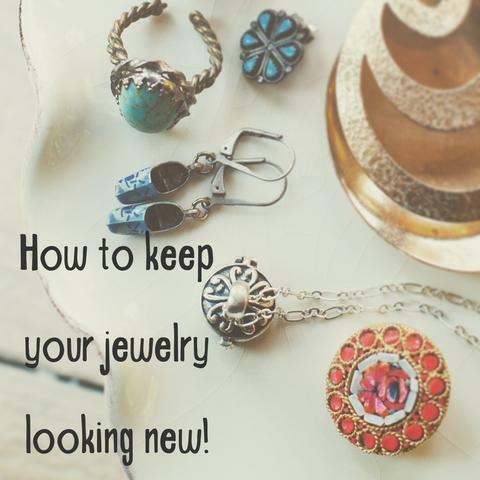 This will keep your less expensive jewelry in tip-top shape! Also, a coat of clear nail polish on the inside of rings that are not solid silver or gold keeps the finger from turning green. Necklaces and bracelets can be ruined by throwing them in random drawers. Properly storing your jewelry by hanging it up neatly or keeping it in a jewelry box will help it stay tangle-free and prevent breakage. It also makes it easier to find what you are looking for! Natural stones are sensitive and some of the cleaning solutions on the market can damage them. When in doubt, use water and a soft toothbrush to gently clean each piece, and let them air dry on a cloth. For pearls, use a wet cloth to gently scrub the build-up off. Clean diamonds by soaking them for 15 minutes in one cup of warm water and 1/4 C. ammonia. Scrub lightly with a soft toothbrush, rinse and pat dry. All sterling silver jewelry will tarnish. The exposed layer of silver reacts with chemicals and even the elements in the air to form something called “patina”. It appears as a faint golden glow that you may notice after wearing your jewelry a number of times. Certain things like rubber, latex, chlorine and sulfur can actually burn your silver, so keep them as far apart from each other as possible. To clean the inevitable tarnish, line a container with tin foil. Fill with 3 parts baking soda and 1 part water. Mix till dissolved, add jewelry and let sit for 5-10 minutes. Rinse and let dry. ~Prevent tarnish from happening or at least, slow the process. Storing your jewelry in a ziplock bag will reduce tarnish formation. ~Remove tarnish from copper and brass. Clean copper and brass by soaking in a mixture of 4 parts vinegar and 1 part salt. These can be found in new purses, shoes and lots of products ordered online. They absorb moisture and keep it away from your jewelry. Save them and place them inside your jewelry box. ~Don’t bend beaded or wire jewelry. Pieces that have been wire wrapped or beads that have been wired together get thrown in drawers, or bent to fit in small spaces. This can weaken the wire and cause breakage. ~Don’t wear heavy lotion or perfumes. Avoid wearing heavy lotion on your neck, hands and wrists, as this can ruin the finish on your necklaces, bracelets, and rings. This is true for both fashion and fine jewelry. It can deteriorate the finish on fashion jewelry and speed up oxidation (tarnish) on both fashion and fine jewelry. ~Don’t use toothpaste to clean jewelry. I see this tip all over the internet. Many toothpaste brands have abrasive bits included to clean teeth. These can scratch stones and metals. There are better ways to clean! ~Don’t put your jewelry on first. It’s always a good idea to remove your jewelry when applying makeup, lotions, hairspray, or perfume. Save the jewelry as your last step in getting ready to go out. ~Don’t use household silver polish. Never use a silver cleaner designed for flatwear for your jewelry. If you care for your jewelry today, it will stay beautiful and will be treasures for your lifetime. And maybe even beyond.